is this true origin of Atlantis? Crete is the largest and most populous of the Greek islands, and the fifth-largest island in the Mediterranean Sea, after Sicily, Sardinia, Cyprus, and Corsica. Crete and a number of surrounding islands and islets constitute the region of Crete (Greek: Περιφέρεια Κρήτης), one of the 13 top-level administrative units of Greece. The capital and the largest city is Heraklion. As of 2011, the region had a population of 623,065. Crete is one of the most popular holiday destinations in Greece. Fifteen percent of all arrivals in Greece come through the city of Heraklion (port and airport), while charter journeys to Heraklion last year made up 20% of all charter flights in Greece. Overall, more than two million tourists visit Crete every year, and this increase in tourism is reflected on the number of hotel beds, rising by 53% in the period between 1986 and 1991, when the rest of Greece saw increases of only 25%. Today, the island’s tourism infrastructure caters to all tastes, including a very wide range of accommodation; the island’s facilities take in large luxury hotels with their complete facilities, swimming pools, sports and recreation, smaller family-owned apartments, camping facilities and others. Visitors reach the island via two international airports in Heraklion and Chania and a smaller airport in Sitia or by boat to the main ports of Heraklion, Chania, Rethimno, Agios Nikolaos and Sitia. According to Greek Mythology, The Psychro cave at Mount Dikti was the birthplace of the god Zeus. The Paximadia islands were the birthplace of the goddess Artemis and the god Apollo. Their mother, the goddess Leto, was worshipped at Phaistos. The goddess Athena bathed in Lake Voulismeni. The ancient Greek god Zeus launched a lightning bolt at a giant lizard that was threatening Crete. The lizard immediately turned to stone and became the island of Dia. 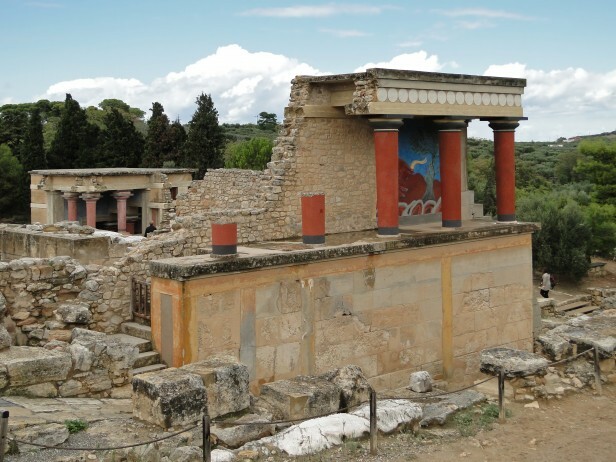 The island can be seen from Knossos and it has the shape of a giant lizard. The islets of Lefkai were the result of a musical contest between the Sirens and the Muses. The Muses were so anguished to have lost that they plucked the feathers from the wings of their rivals; the Sirens turned white and fell into the sea at Aptera (“featherless”) where they formed the islands in the bay that were called Lefkai (the islands of Souda and Leon). Hercules, in one of his labors, took the Cretan bull to the Peloponnese. Europa and Zeus made love at Gortys and conceived the kings of Crete, Rhadamanthys, Sarpedon, and Minos. Arranging a private jet charter to and from Heraklion (LGIR / HER) or Chania (LGSA / CHQ) is straightforward. Both airports have good access to the tourist resorts including, Agia Marina, and Kissamos, Maleme, and Platanias all served by Chania, and Heraklion serving Elounda, Malia, Sitia, Stalis, Hersonissos, and Agios Nikolaos. A private jet charter from London to Heraklion or Chania will take approximately 4 hours 30 minutes in a 6 seat Cessna Citation CJ2 jet (with a fuel stop en-route) , and 4 hours 10 minutes in a 8 seat Cessna Citation XLS jet. Arranging a private jet charter or helicopter transfer with Freedom Air to arrive in style to Crete is simple. The Freedom Air team can be reached on +44 (0) 1275 548001 to book your next trip.